If you live in an apartment that has a balcony or terrace with floor and ceiling, create your own ‘conservatory’ by enclosing the area with our Frameless Glass Doors. This would prolong its use during seasons of cool breezes and rain showers. 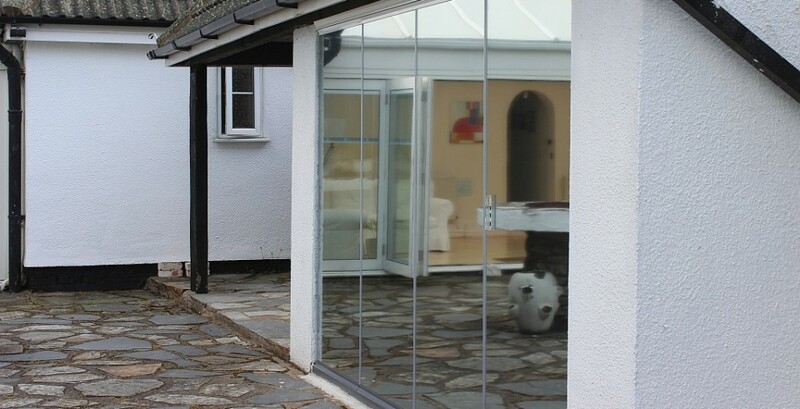 SunSeeker tempered glass could be used to replace the doors to your summer house or garage, creating a bright space to use for leisure and pleasure. 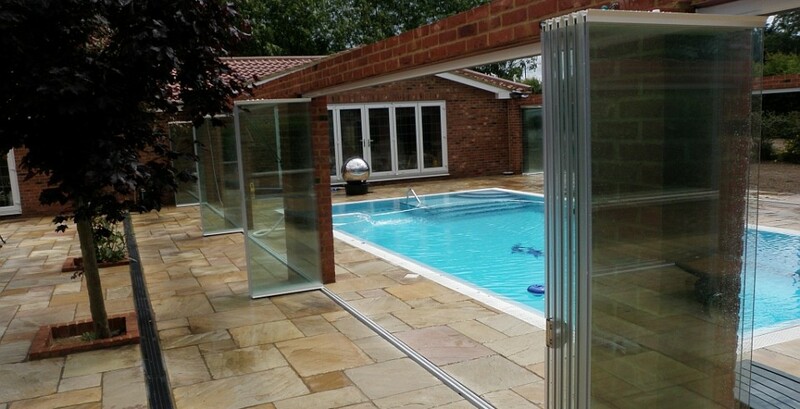 Frameless Glass Doors are also ideal to enclose the sides of covered swimming pools, defending pool users from cool blasts of wind. 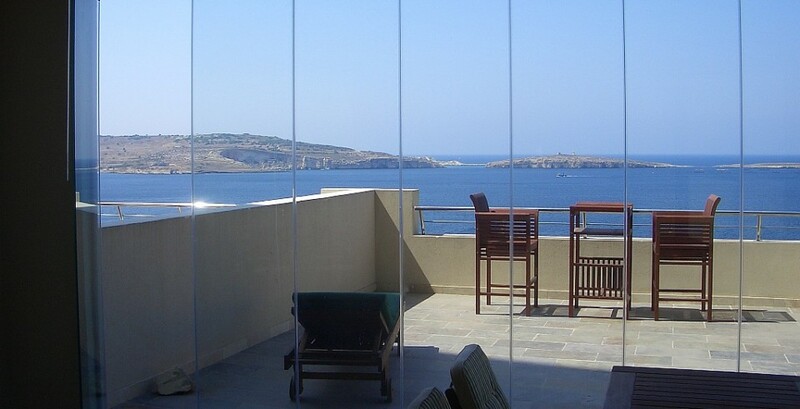 The advantages of frameless glass doors are the exceptional amount of light that can pass through the doorway, whether the doors are open or closed, and the virtually uninterrupted panoramic viewing capability. 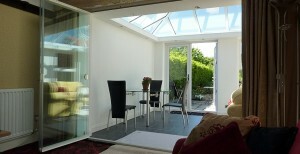 Please view our photo gallery of glass door installations. 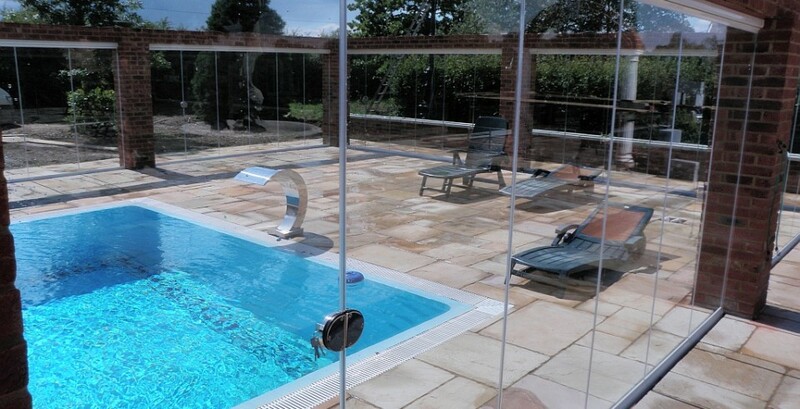 Frameless Glass Doors comprise a frameless door that opens conventionally plus a number of tempered glass panels that can slide along tracks to the end of the opening, then open to rest inconspicuously against the end wall, maximising the access space. If you just want to let some air flow, the panels can be positioned anywhere along the track. Also available as room partitions and with a number of glass options** including tinted or mirrored, Frameless Glass Doors can be used wherever building regulations allow (i.e. single glazed applications may not be used on an external house wall) but they can be installed on out-buildings. They are ideal for commercial applications, such as restaurants. Whether you have a French door size opening or several metres of arched cloisters, SunSeeker Frameless Glass Doors could enhance your useable space and will be manufactured for a perfect fit. 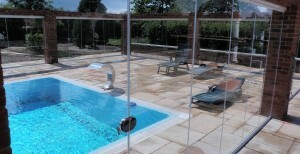 Our quotation is free and hassle-free.